Boeing has issued changes to controversial control systems linked to two fatal crashes of its 737 Max planes in the past five months. The Manoeuvring Characteristics Augmentation System, better known as MCAS, is software designed to help prevent the 737 Max 8 from stalling. It reacts when sensors in the nose of the aircraft show the jet is climbing at too steep an angle, which can cause a plane to stall. At a Senate hearing to discuss airline safety, senators questioned the FAA's acting head, Daniel Elwell, about the regulator's practice that involves employees of a plane manufacturer in the process of inspecting, testing and certifying the company's own aircraft. Mr Elwell denied that it was "self-certification" arguing that the FAA "retains strict oversight authority" of the process. 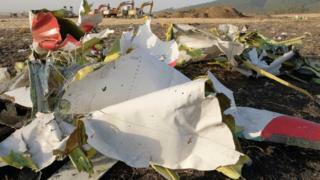 He said that the practice was used "globally", including by the European Aviation Safety Agency. Earlier, announcing the package of cockpit upgrades, Boeing said a final version of the software would be submitted to the Federal Aviation Administration (FAA) by the end of the week.